Closer U.S.-India Ties Make Strategic Sense. What’s Holding Them Back? Indian Defense Minister Nirmala Sitharaman greets U.S. Defense Secretary Jim Mattis, New Delhi, India, Sept. 26, 2017 (AP photo by Manish Swarup). When U.S. President Donald Trump unveiled his new strategy for the Afghan war in August, he called on India to become more involved in Afghanistan’s security. 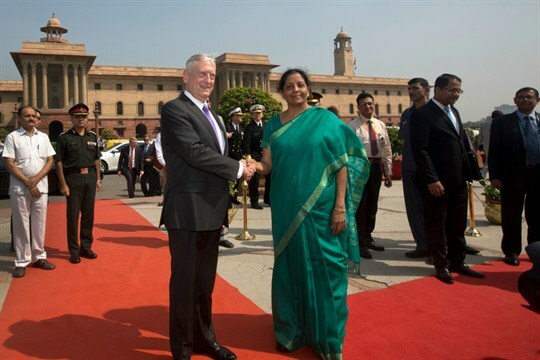 Secretary of Defense James Mattis followed up with a visit to India in September to discuss deepening economic and defense ties, raising the possibility of a greater partnership between Washington and New Delhi. In an email interview, Richard Fontaine, president of the Center for a New American Security, explains why closer cooperation between the U.S. and India has failed to fully materialize despite obvious advantages, and what the Trump administration can do to overcome historical impediments to develop a counterbalance to Chinese influence in the Indo-Pacific region.